Through the Enhancement of Technical and Vocational Education and Training (E-TVET) Project, eight Practical Instruction Centres will be built and 101 classrooms and workshops constructed or upgraded. They will accommodate over 3,500 students at the Lower Secondary School level. “CDB is very pleased to be commencing this partnership with the Government of Suriname. 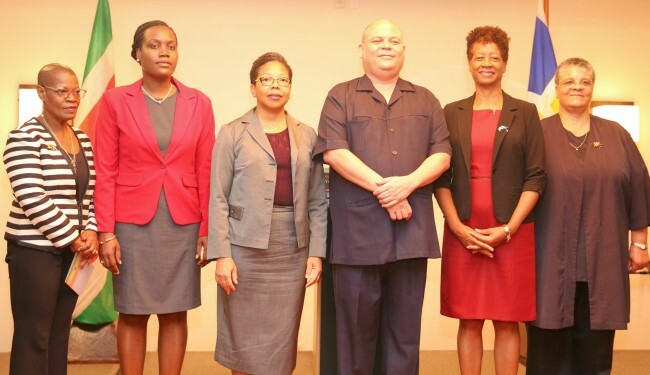 The competencies which Surinamese students will develop as a result of this Project will equip them to seek further education, to obtain sustainable employment and to enter into the workforce, thereby promoting and sustaining economic transformation and development,” said Patricia McKenzie, Vice President (Operations), CDB. In Suriname, students assigned to TVET programming, particularly those who live in remote areas, have limited or no access to practical education—a key component of TVET. The E-TVET Project addresses this issue through the construction of the Practical Instruction Centres or hubs, which provide hands-on competency development for every student in TVET programming. The hubs will be outfitted with furniture, equipment and instructional resources that will allow for better preparation of students for further education or the workforce. “Suriname has committed itself, on a national and regional level, to reform technical and vocational education to provide productive workers who meet the standards needed. It is important to create fair and equal chances in the educational system in Suriname. This Project supports the development, strengthens the human capital and restructures the total educational system for a smooth integration of school and work,” said Hon. Robert Peneux, Minister of Education, Science and Culture. In addition to enhancing the learning environment for TVET students, the E-TVET Project focuses on improving the effectiveness of technical and vocational instruction and the quality of TVET delivery through the development and revision of curricula; the expansion of TVET study options available to girls; and teacher training and continuing professional development. It also includes the development of a National Qualifications Framework; a maintenance policy and plan for the Practical Instruction Centres; and a plan for their successful operation. Under the E-TVET project, community continuing education programmes, particularly in remote areas to equip community members with skills for sustainable employment, will also be implemented. CDB will conduct a workshop as part of the Project launch, during which Bank staff will make presentations to 70 participants to familiarize them with actions needed for effective and efficient implementation of the Project. The E-TVET Project is part of the second phase of a programme of enhancement launched by the Government of Suriname in 2011 to ensure that all students at the Lower Secondary School level participating in TVET have opportunities for skills development, as well as additional pathways for advancement in the education system. This intervention aligns to the Bank’s Country Strategy Paper (2014-2018) for Suriname and accords with the Suriname National Development Plan (2012–2016).